Many advanced users prefer to use firmware files when updating their iOS devices to the latest version, and every time an iOS update comes out we post direct download links for the latest versions. Every once in a while we get questions from users who wonder how we find those file links, since they’re tucked away on Apple’s download servers, seemingly hidden from the public view. Well, there isn’t any magic to this and it’s easily done through the command line with a simple trick that pulls a full list of IPSW files that are available directly from Apple. At it’s most basic form it lists literally everything, but with some minor changes to the command syntax you can sort for specific iOS versions or for files that match a specific piece of hardware. This likely won’t be useful to everyone, but for users who like working with IPSW, or for systems administrators who need to download a bunch of different firmware files to perform bulk updates on a bunch of hardware, this should be helpful. For everyone else, it can be a lesson to further prove we at osxdaily are nerds who spend too much time thinking about this stuff. If you’re going to try these yourself, copy the full syntax block and paste it into the command line. The commands look broken apart on the web, but they should paste fine into the command line as a single command string on a single line. That will dump everything into a text file named ‘ipswlist.txt’ on the desktop. Add “> ~/Desktop/iPhoneIPSW.txt” to the end to send the results to a text file on the desktop. As before, you can send that into a text file if desired by adding “> ~/path/to/text.txt” to the end. Apple is quick with pushing out updates and because of the Over-the-Air mechanism most people notice new updates almost right away when they become available. 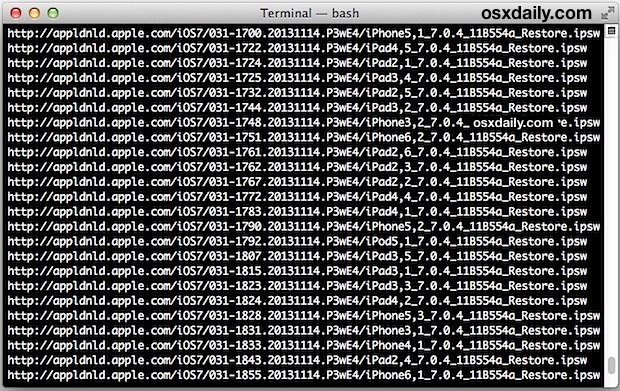 Nonetheless, some users use a variation of the above trick to monitor for new iOS releases by periodically querying for various version strings that do not yet exist on Apple’s servers. That’s a bit beyond the scope of this article though. There may be cleaner and/or better ways to do this, chime in the comments if you have another solution. any chance to automatically download all the latest ipsw files? It would be recommended to use the “sort -u” at the end of the filtering (just before output). Sorting is really expensive. I’m currently working on using curl to do the downloading instead. < this redirects to the latest xml. Is this script currently operable, I currently work for a company which could make great use of this. Hey, any chance you know the link to Apple’s server that hosts the beta firmware links aswell?